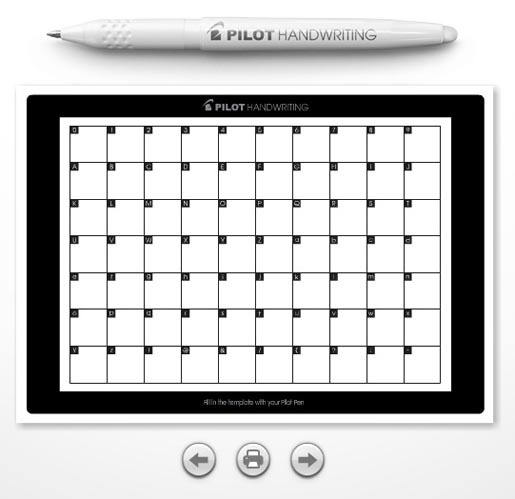 Comercial Arge, the exclusive distributor of Pilot products in Spain, commissioned a web application, www.pilothandwriting.com, to let people turn their handwriting into a digital font. The site, designed to help people value their capacity to write by hand, became popular as users sent emails to one another in their own handwriting. The campaign won a Gold Cyber Lion at Cannes International Advertising Festival. Production staff were photographer David Barra, 3D illustrator Lucas Pigliacampo at Mentopia studios, programmer Ramón Illobre, director Gonzalo Oliveró at RCR & Crampton with producer Dani Monedero.